AT&T announced on Thursday that it will begin to offer its Mobile Hotspot MiFi Liberate and the Samsung Galaxy Express Android smartphone beginning on Nov. 16. The AT&T Mobile Hotspot MiFi Liberate was created by Novatel Wireless and offers a 2.8-inch color display, the ability to share your 4G LTE connection with up to 10 Wi-Fi-capable devices, 11 hours of battery life, connectivity in more than 200 countries and microSD card support for local storage. The Liberate will cost $49.99 with a new two-year contract. Additional details on the Liberate can be found in the video above. The Galaxy Express offers a 4.5-inch Super AMOLED Plus display, a 1.5GHz dual-core processor, 4G LTE support, NFC, a 5-megapixel rear-facing camera, Android 4.0 Ice Cream Sandwich, a 2,000mAh battery and more. It will retail for just $99.99 with a new two-year contract and, for a limited time, anyone who buys a Samsung device will get $100 off a second Samsung product from AT&T. Developed by Novatel Wireless (NASDAQ: NVTL), and powered by the nation's largest 4G network, the MiFi Liberate is the first mobile hotspot device with a touchscreen display. Its vibrant 2.8" color touchscreen display takes ease-of-use to the next level. Customers can easily connect up to 10 Wi-Fi devices. They can also view data usage, manage connected devices, change network and device settings, and more—all directly from the touchscreen. The MiFi Liberate, which offers access to 4G LTE speeds, boasts an industry-leading, powerful battery that provides up to 11 hours of continuous use. The global-ready MiFi Liberate also offers connectivity in more than 200 countries, making it more convenient to browse the Internet, check and send email, and upload photos while abroad. Customers can also easily access and share files and media stored on the inserted microSD card** from connected Wi−Fi or DLNA capable devices. A look at the MiFi Liberate's features in action is available in this video. First-time smartphone users and people looking to upgrade to a new Android smartphone will find their perfect match with the Samsung Galaxy Express, a 4G LTE smartphone that combines high performance features at a great price. The Galaxy Express is exclusive to AT&T, runs Android 4.0 (Ice Cream Sandwich) and sports a clear and bright 4.5-inch Super AMOLED™ Plus screen. The 1.5 GHz dual-core processor and 2000 mAh battery helps users stay productive throughout the day; while the 5-megapixel rear facing camera lets you capture and share images easily through text messages, email and social networks. With Samsung Galaxy Express, customers can also enjoy some of the popular sharing features introduced in the popular Samsung Galaxy S® III, like S Beam which allows content to be shared between S Beam enabled devices by simply touching them back to back. 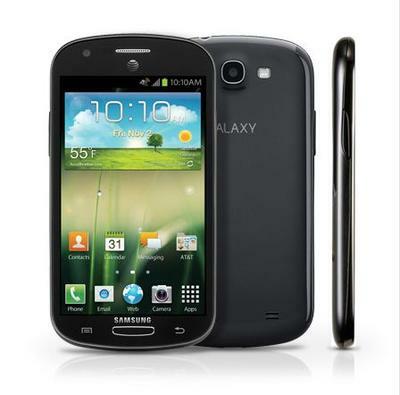 For more information about the Samsung Galaxy Express, please visithttp://www.att.com/galaxyexpress. AT&T customers have access to the nation's largest 4G network, covering 285 million people. AT&T has two 4G networks that work together for customers, LTE and HSPA+ with enhanced backhaul. That means AT&T customers are able to enjoy a widespread, ultra-fast and consistent 4G experience on their compatible device as they move in and out of LTE areas. **** With other carriers, when you travel outside of their LTE coverage area, you may be on a much slower 3G network.